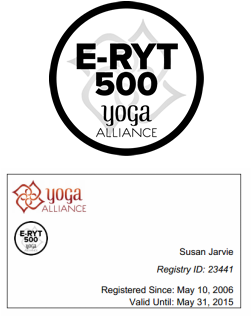 Susan Jarvie is a an Experienced Registered Yoga Teacher (E-RYT® 500) through Yoga Alliance®. Yoga Alliance® is the national education and support organization for yoga in the United States, formed in 1999. They work in the public interest to ensure that there is a thorough understanding of the benefits of yoga, that the teachers of yoga value its history and traditions and that the public can be confident of the quality and consistency of instruction. Yoga Alliance also established a national Yoga Teachers’ Registry to recognize and promote teachers with training that meets their minimum standards. Teachers who meet these standards are eligible to register as Registered Yoga Teachers (RYT®s). In 2005, in conjunction with enhanced and revised standards for registration, they began recognizing and registering teachers with significant teaching experience in addition to training. These teachers can register as Experienced Registered Yoga Teachers (E-RYT®s).